Planning- It’s that thing we do to help us manage our time better. Planning is supposed to help us make the most of our time. Yet, planning too much can actually be crippling to us when it begins to cause us to stop simply living our lives. As I sit down each week and fill out my planner it is almost overwhelming how much I have to actually get done in one day. Every minute of every day seems to to be accounted for. This way of living has become exhausting and crippling for me. I pray that you will join me as I begin to do something about this in my own life. To fix this personally for myself I will be……..
Learning to say NO! I know my schedule is out of control because I am constantly saying yes to all that is asked of me. I am going to be saying no to certain request and yes to request that consist of “Mom let’s have a tea party”. Clearing out some things that have become busy work. It’s no secret that I lead a busy life. However, some of the things in my life are no longer a need. They are things that I am no longer called to do instead they are things that I have allowed to consume my time simply because they have always been there. Unless I feel led by God to continue to do something I am clearing them out. Make sure that I leave some white space. Instead of filling my planner to its limit I am going to attempt to leave a lot more white spaces. Freeing up my time for those around me. Not to mention in doing so I will be able to breathe. Extend myself a lot more grace. I am so hard on myself when it comes to not completing things on my to-do list. Yet, because I am so focused on completing the list I miss out on some pretty amazing things. We will not always be able to complete our tasks but we can make some amazing memories with our families. So I am going to have a top ten list of things that have to be done and then after that the rest is just fluff. 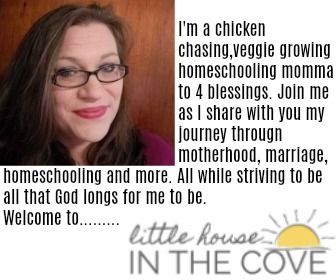 Living more and planning less is just what this momma needs. Will you join me? 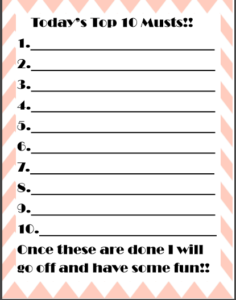 To help you on your journey here is your own top ten list that you can print out and use. Just laminate it and go! Check Your email for your free packet! This is something that I’m striving for too. We can get so busy with all of the day to day tasks, so important to leave time just to “be”. I completely understand it is so hard to just be when your mind is racing in other directions.